Step 1 Bring the bones and pork to boil in a large pot with water to cover. Drain and rinse well. Fill the pot with 16 cups of water and add the bones and pork. Bring to a boil, skimming the surface as needed. Add the fish sauce, salt, sugar, shrimp paste and lemon grass stalks. Reduce the heat and simmer until the meat is tender, about 1 1/2 hours. Step 2 Remove the pork and set aside to cool. Strain the broth into another saucepan and bring to simmer. Wrap the cooled meat with plastic wrap until ready to slice. Discard the bones. Add more water if needed to bring to 10 cups of liquid. Step 3Heat the oil in skillet over medium heat and add the shallot and minced lemon grass. Stir until fragrant, about 15 seconds. Add the paprika and cayenne and remove from the heat immediately. Stir the mixture into the broth. Step 4Meanwhile, soak the vermicelli in water to cover 30 minutes to plump the noodles. Drain. Cook the noodles in plenty of boiling water until soft but firm, about 15 minutes. Drain and rinse. Step 5Slice the cooked pork. Return the broth to a boil. Step 6Place about 1 1/2 cups of noodles in each of 8 soup bowls. Place a few slices of beef in a slotted spoon and warm in the boiling broth. 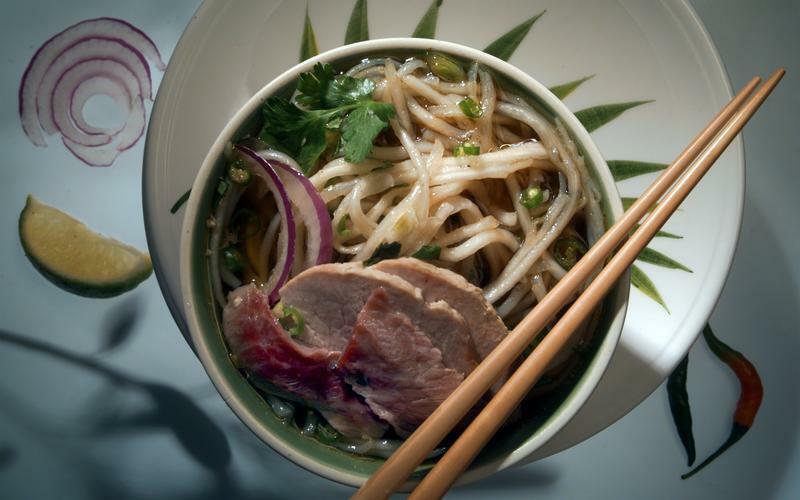 Arrange the sliced beef and pork on the noodles in each bowl and ladle broth on top. Step 7Garnish with red onion slices, cilantro, green onions and rau ram. Serve lime wedges and chopped chiles on the side. In Recipes-list.com we have selected the most viewed recipes from category - Soups . Enjoy the best recipes specially selected for you! Beef Vermicelli Soup (Bun Bo Hue) is the right choice that will satisfy all your claims.